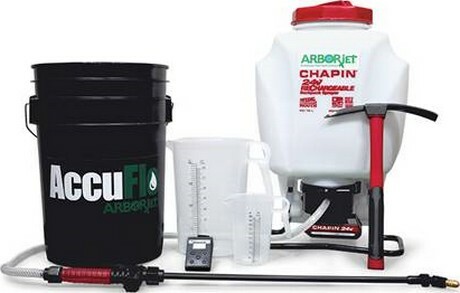 "Apply the proper dose from any spray tank at a reasonable price"
Arborjet announces the launch of the new AccuFlo Flow Rate Meter, representing a shift in the way industry professionals apply liquid nutrients, pesticides, and fungicides. Made from 3D printed carbon fiber, the AccuFlo is durable, but extremely light. “At Arborjet, we don’t rush to modify a widget or blindly follow a request for something longer, shorter, heavier or lighter - we focus on the job the customer is trying to accomplish. That’s what led to longer lasting injection formulations and to the tremendous success of the QUIK-jet Air,” said Russ Davis, President and COO. The new AccuFlo is another shift in that direction. 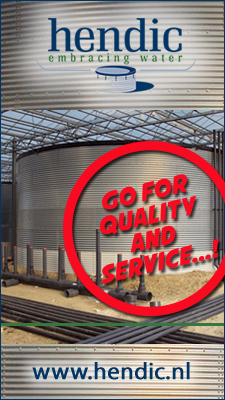 “The job isn’t to provide a flow meter to measure the flow of a particular spray tank. The job is to be able to apply the proper dose from any spray tank at a reasonable price,” adds Davis. The AccuFlo replaces the need for flow meters that cost hundreds of dollars more and are ten times heavier. Flow meters often require a power source and have many moving parts that can gum up or clog. The CP 110 material is a Carbon Fiber material specified by Celero Partners. The AccuFlo attaches with Velcro to any wrist or mechanical part of a spray system. It calibrates to the flow and liquid viscosity in seconds. When in calibration mode, the applicator simply dispenses a known amount into a graduated cylinder. The AccuFlo then converts that dispense time into flow and is ready to go. 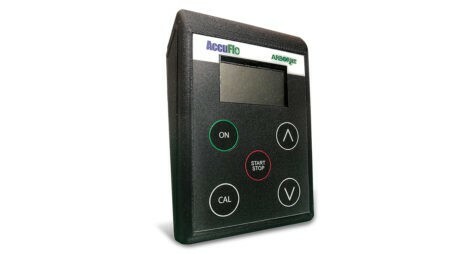 By using an arrow to scroll up or down, the appropriate amount to dispense may be selected and the AccuFlo will sound when the intended application amount is reached. It will also remember that flow rate until changed.